With fall chill setting in, there is nothing better than spending a morning with The Boston Globe, wrapping your fingers around a mugful of hazelnut coffee and indulging in a soft, doughy donut. This weekend donut treat ritual began at an early age for us. Kara, James and I always looked forward to Dad setting a striped cardboard box of freshly baked assorted donuts on the kitchen table. Upon opening the parcel, our eyes instantly glazed over at the spread: Jelly stick for Mom, Boston Cream for James, Butternut for Dad, Plain or Glazed for Kara, and Coconut for me. While at nearby KitchenWares by Blackstones on Newbury Street, I was instantly attracted to an adorable mini donut pan and made an impromptu purchase. I had never baked donuts before, so decided to start with my favorite flavor. To add the subtly sweet hint of coconut into each bite, I added coconut milk to the batter which also created a moist, cake-like consistency. After baking, I adorned the rings with a glossy coconut glaze and textured sprinkling of shredded coconut. Preheat oven to 350 degrees Fahrenheit. Lightly butter a mini donut pan. In a medium bowl, whisk together flour, baking powder, salt, and cinnamon. Set aside. In another medium bowl, cream together the butter and sugar with an electric mixer. Add the egg, coconut milk, and vanilla and continue to mix for a 1-2 minutes longer. The mixture will look lumpy. Gradually stir in the dry ingredients and stir until smooth. With a small spoon, fill the doughnut pan about 2/3 full in each mold. Bake for 10-12 minutes until the rings are slightly golden and firm. Empty them to a wire rack and repeat with the second half of the batter. 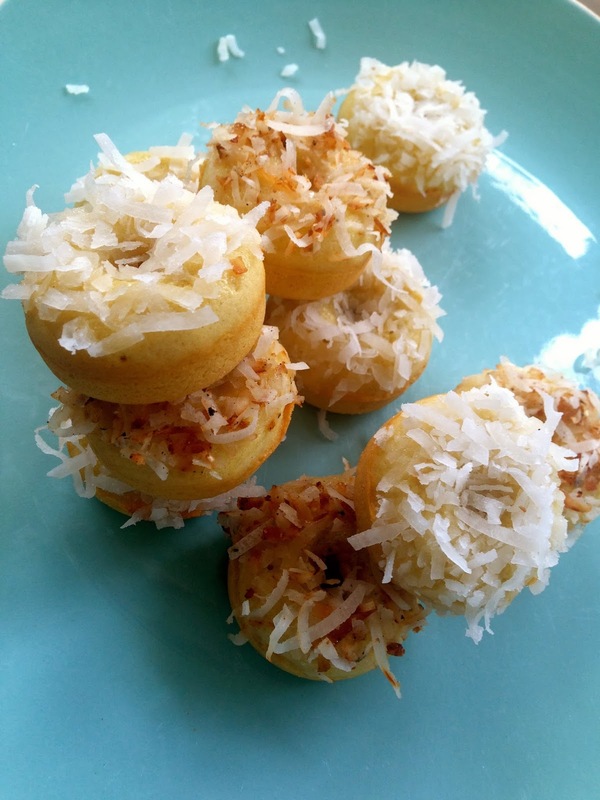 Allow the donuts to cool slightly before dipping them into the glaze and shredded coconut. To make the glaze, whisk together the powdered sugar and coconut milk in a bowl until smooth. Generously dip the top halves of the donuts into the glaze, and then dip half of the donuts into the toasted coconut and half in the raw coconut. Use your fingers to evenly coat the surface. Makes 24 mini donuts. FYI to make toasted coconut, heat a nonstick pan on medium. Add the coconut and stir with a wooden spoon until golden brown, about 4-6 minutes. Set aside to cool before topping. Piled high atop a pastel cake plate, the snowball donuts are the perfect sweet for your next cozy brunch!